The healing power of pu’erh tea can now be yours! That’s right, there is something magical about this ancient Chinese tea that has been nicknamed the ‘skinny girl’s tea’ and has been treasured for centuries due to its many health benefits. Studies have shown that this tea has some very interesting properties that can combat various ailments and conditions. For example, it can assist in controlling cholesterol levels, decrease blood pressure and possibly increases metabolism. It is because of these qualities it has been considered a ‘diet tea’. While there is evidence to suggest it does assist in dieting, it is never recommended for use just for that purpose although it can be added to a healthy diet program. According to traditional Chinese herbal remedies, this tea is effective when used to aid digestion, and as a result, it was typically consumed following a large meal or as a cure for a hangover. Now I can’t even give you a testimonial on whether or not it works for either of these conditions, but I’ve seen enough evidence online to make me think it is possible. Tea leaves picked from centuries-old Yunnan trees in China are subjected to a fermentation process that can take years to reach the perfect condition for brewing. Heat and moisture play a part in the processing and the finished product is available in loose leaves, disc-shaped cakes, and the popular brick form. This particular brick size is enough to steep a total of 48 potfuls of tea. I’m a fan of pu’erh tea for a variety of reasons. I think the biggest one is the flavor. Once I brew myself a pot I find the deep and rich taste reminds me of an earthy, almost mushroom-like, flavor. It may not sound appealing at first, but once you try it you’ll understand what I mean when I say you know that you’ve had something substantial in your cup just from the taste… not like some teas that can almost seem so light that you wonder if you were drinking tea or colored water. 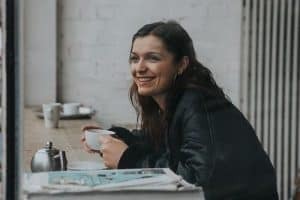 I also like the fact that it contains a high concentration of antioxidants and I find it gives me a slight boost and allows me to focus my concentration slightly better if I enjoy a cup late in the day. The environmentally-conscious part of me really likes this packaging as the boxes are made of recycled material. The Numi company also uses a type of tea bag that is biodegradable, compostable and free of GMOs. I rate this ginseng tea product high as my favorite alternative to coffee and it mixes well with chocolate or any other flavor you like adding to a hot beverage. If you want to improve your health, then this tea contains anti-oxidants which is far healthier than drinking too much alcohol. I would never use this product in place of a proper, healthy diet program but I can see where it could assist with some diet goals especially because it has such a good effect on the digestive system. I think it’s safe to say it may not be exactly as powerful as a magic pill, but when used properly you will be able to experience some of the health benefits of pu’erh tea. 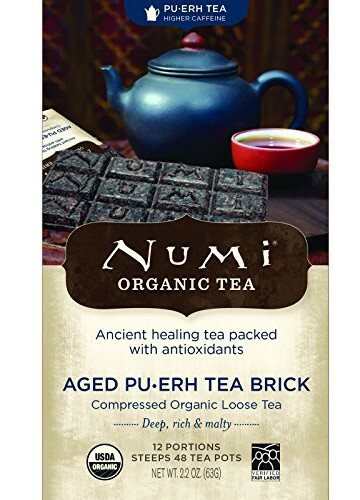 For more information on Numi Organic Aged Pu-erh Tea, click here.